The Invaders was a popular (with me anyway) TV program in the Sixties, based around a race of aliens living among us here on Earth. Impossible? – well, have you seen the editor of this publication? Anyway, the opening contained the words: “It began with the landing of a craft from another galaxy”, and I became fascinated by the thought of other galaxies. I didn’t know then that you can actually see another galaxy with your own eyes, without any optical aid (though I do need to wear my specs nowadays!). This is the perfect time of year as it is now high overhead and the crisp clear autumn evenings can make ideal viewing conditions. 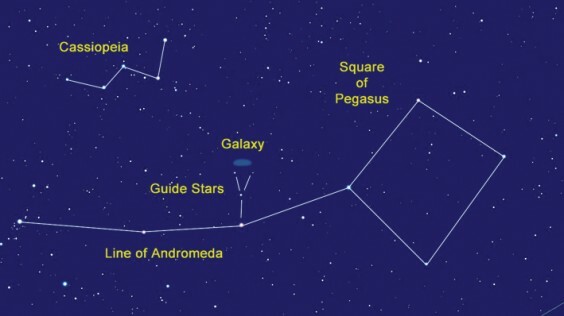 As ever, you will need to get away from the street lights but once there, look high to the south east to find the very obvious four stars of the square of Pegasus. Higher still is the crooked W of Cassiopeia. The upper right star of the square is Scheat and it is a Red Giant, nearly 300 times the size of our Sun. In common with most Red Giants it “pulses” so its brightness varies and it will, at some time, explode in a supernova. At 200 light years away, when it does, it will probably put an end to my scribblings. The top of the square forms a curved line with three equally bright stars of Andromeda to the left. The first of these is also pointed at by the right hand “V” of Cassiopeia. Above this is a “Y” of fainter stars which guide you to the Andromeda galaxy. It appears as just a misty patch and, at 2.5 million light years away, is considered to be the most distant object that can be seen with the naked eye. Binoculars will give it more form and this is the best way to see it but sit down to avoid falling over backwards! Take time to study it because it is very similar to our own galaxy, although much larger, and who knows, there may be something out there looking back at us and making notes about our galaxy in some strange, incomprehensible language! Nearer home, Jupiter is big and bright and outshining everything in the night sky and should make a fine sight with the nearly full Moon on the 9th. Look for it below Cassiopeia and Andromeda. Nearer still, the Chinese have launched a small space station, which is visible to us here in Alvechurch but only just. Its orbit doesn’t make such a large angle to the equator as, say, the ISS, so it never actually passes over the UK. It is also quite tiny by comparison so it is never very bright and never very high in the sky but keep an eye on heavens-above.com and see if you can spot it. Finally, I can predict there will be nothing to see on the nights of the 24th, 25th and 26th so you may as well go to Alvechurch Village Hall and watch the stars there!